Creativity comes in many forms – painting, pottery, jewelry and fashion among them. Regardless of the medium, skill in manipulating it is a talent. While other artists work with paint, clay or metal, the fashion designer’s tools are fabric, thread, buttons and zippers. Clothing was originally made based on function and culture, a symbol of the wearer’s lifestyle. Eventually, artistic expression came through in textile design. And there are fashion designers in Cabarrus County making their own statements. “Our” refers to women, and Folayan strives to tell the story of strong, hardworking women, both West African and those struggling in today’s communities. 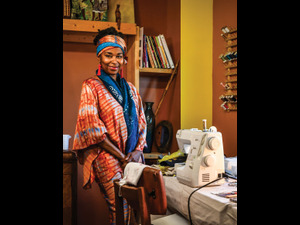 She maintains a studio at Concord’s ClearWater Artist Studios for her craft. “I make things in small quantities, by traditional methods and by hand. I make things that may be functional or strictly decorative. My affinity toward cotton, natural fiber, stitching and mark making comes from a deep place of memory from within. 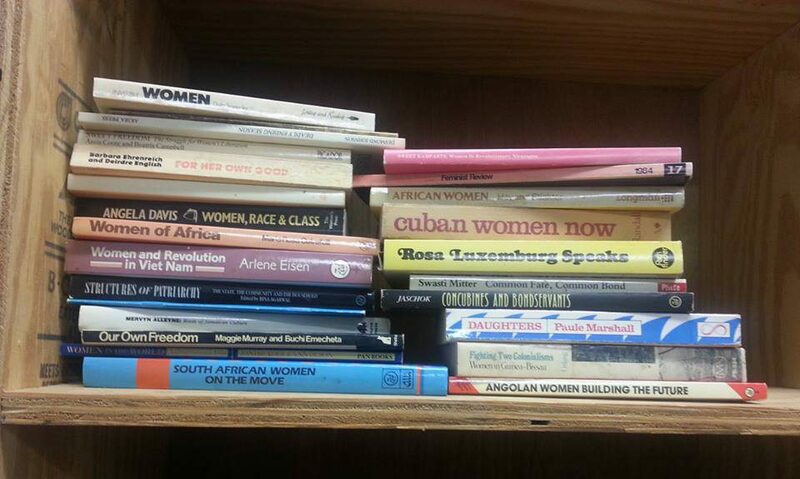 I use these tools as vocabulary to honor the tedious, unrecognized work of women’s hands. My work also honors the unpaid work of my foremothers’ hands,” she explains. Creating both art and fashion, Folayan first painted on silk, giving away the completed pieces to her family. That evolved into dying natural fiber. When creating one of her wraps (page 15), Folayan explains her technique. “I remove the fabric from the bolt and scour it by machine to remove any dirt and chemicals from the machines that process the fiber. Although I sometimes work with wet material, for these wraps I use dry fabric so I have more control over color and design placement. “I then cut out and stitch the garment. Then I determine the colors and general theme. I use fiber-reactive dyes. As a surface designer, I use a variety of techniques to transform the essence and plane of the garment. This usually involves using a variety of techniques that cause the fiber to take in color in some places while creating active resists in other places. “In addition, I selectively add and remove more color, and I often use paint and screen printing techniques for further customization. Finally, once complete and the excess dyes rinsed away, the garments are sometimes embellished with paint or seed beads, etc., dried, steamed and pressed as finishing. The iron is one of the most important tools of the art of this craft! Having delved deeply into the history of indigo last year, Folayan plans to offer Blue Prints – A Surface Design Class in Glorious Shades of Blue, beginning this month at ClearWater. “In my studies on blue, I’ve learned lots about indigo and its importance to trade and global economy: How human lives were exchanged for blue cloth in West Africa, how the color became associated with transcendence, pain, fine artisanship and hope,” she says. 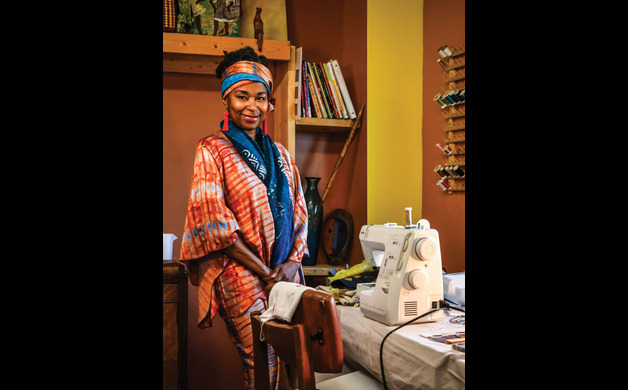 One of Folayan’s affirmations is, “Be a lifelong learner.” If you’d like to learn more about her design work or would like to join her in Blue Prints, call ClearWater Artist Studios at 704-784-9535 or visit clearwaterartists.com. Blue Prints…a surface design class in glorious shades of blue! The color blue historically has been associated with emotion, spirituality, alchemy, mystery and pathos. As I mature in work as a change agent, I take self-care very seriously, and my studio is often my refuge. This year I am studying up on the color blue and its significance in our lives and in particular the intersections of culture impacting my life and work. Having times of mindful meditation is necessary at this time in my life-especially with all the turmoil going on in today’s global, economic and political landscape. For nearly 20 years, I have been working through my own emotions about struggle, financial trauma and the ongoing multi faceted relationship I have with money. Despite being “well-educated”, and growing up “Middle Class” in the Midwest, I became a single mother subsequent to escaping domestic violence and divorce. I spent a long time working through the losses of people, places, identity and things- many years struggling to live at or just above poverty. It has taken lots of emotional and physical work to heal from the emotional and structural barriers that made it difficult for me to thrive financially. Last fall I ventured out onto another leg of learning about my relationship with money: I traveled part of the Transatlantic Slave Trade by going to Amsterdam, and London (where it began) and then traveling by ocean liner back to the port of New Amsterdam aka New York City. In my studies on blue, I’ve learned lots about indigo, and its importance to trade and global economy: How human lives were exchanged for blue cloth in West Africa, how the color became associated with transcendence, pain, fine artisanship, and hope. My work as a therapist often found myself interpreting affect as clients discussed the various shades of their emotional blues. As a musician I help provide the background root rhythms for blues and jazz- both art forms created to make sense of often unbearable pain and suffering in this land called the USA. My current work as a a social work entrepreneur addresses the need to create financial security, and gives shameless permission to make money while simultaneously healing the blues many of us have around money. This is especially true for some women, American Black women, creatives and professional helpers As a commissioned studio textile artist, working in blue has helped me to make spiritual connections throughout various aspects of life and culture-literally “tying” it all together! For blues lovers, we’ll be hand stitching, tying, stamping/printing, using immersion and discharging techniques. This course will also provide an introduction to indigo dyeing on natural fiber. The significance of the color blue will be discussed as well as history concerning indigo as color and plant. Participants will use music and poetry as their muse, and we will discuss color theory in composition. 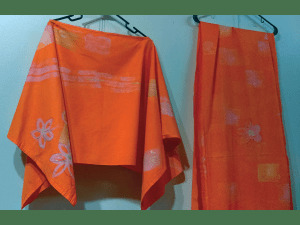 Participants will create fabric with their personal memories abstracted onto cloth. Participants will leave the course with yards of custom fabric which can be used as-is, or further embellished for use in other projects. Classes are limited in size due to the intimate nature of the group. Price: $140.00 Total; $50.00 deposit to hold your space. Enroll using PayPal link below. Class times: For 2-day workshop, Generally 10am-12pm is instruction/prep, 1pm-6pm, application and clean up; lunch options are sent upon receipt of deposit. Final Payment is required no later than 7 days prior to the beginning of class. This class will also be offered as a Beta class June 2,3, 2017; and June 9-11, 2017. Materials list and class specifics will be sent upon receipt of deposit. She’s gone. She left sometime after my mother’s death and my youngest child’s entry into college. I downsized my home, got a room mate for the first time in life, spent more time in my studio, and decided to start figuring out this thing called life. 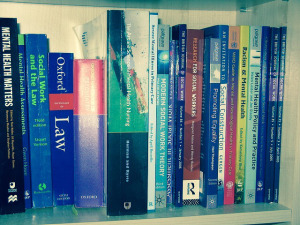 I also wondered how it all related to my identity as a social work practitioner. In the midst of all this transition and change the Strong Black Woman who resided in my mind and body…left. I know not where she went, but I am glad she is gone. Much research has been garnered about the Strong Black Woman whose roots lie in survival during oppression and occupation in the lives of Black people as a result of the holocaust of the Transatlantic Slave Trade. She’s lived through the periods of slavery, Jim Crow apartheid, and the present New Jim Crow era where of mass incarceration pierces the peace of so many families. It’s never been natural to act as both mother and father, to perform with precision when healing from or reacting to trauma, to have to seek refuge in an alternate reality which denigrates one’s own. Yet, we have survived and thrived to a degree in the midst of the impossible.The Strong Black Woman still lives in the lives of many.She can’t make mistakes, makes miracles out of impossible situations; she’s the bedrock of the family, the salt of the earth, the capable community advocate and erstwhile church fixture. She gets things done, at all costs because she’s all in. On February 1, 2012, my mother passed away. She was the strongest, most beautiful, gentle and magical woman I have ever known. As a young, Black female mental health practitioner at the Menninger Foundation during my childhood, racist and sexist policies were the norm, not the exception. She was not allowed to obtain a clinical specialist’s license but she did become a licensed technician.in mental health. She was also an artist: a ceramicist, china painter, upholsterer; beer and wine maker and baker of exquisite culinary delights. She could race a car and cry her way out of a ticket. Sometimes she worked to the point of exhaustion, and she must have worked a lot through the grief of miscarriages, a challenging marriage, and the death of a newborn. As the years progressed she began to travel and think less of what others thought, including her own husband. She was a brave soul; a courageous and beautiful woman. She had all the answers, even when she didn’t- because she had to. I no longer have the answers. I no longer have the answers, nor do I have to have them. I’m curious and anxious and a little off-kilter, but I am not surprised about the current state of political affairs. This has been our reality for as long as I can remember. I’m refashioning myself, refining my artistic voice, resuming dance class, and finding it easier to speak my mind. I cry in front of people I work with, accept gifts from them, and give gifts in return. I gently support my daughters, but I don’t take on responsibilities that are no longer mine (Their failures to plan are not my emergencies.) Mostly, the best gifts I give my grandchildren is my time. I travel, spend time alone, and with friends. I think a lot, and laugh out loud. I enjoy dressing up, going out on occasion, and being catered to. I love to read. I weave, dye and paint patterned textiles. These activities give me the strength and energy to do the work of addressing the issues of financial capability, and justice- based food access, all of which directly affects the safety, security, mental health and well being of women, girls and families. The Strong Black woman is gone, but in her place, I have found a mindful space, and a slower pace to accomplish this important work. The work will not happen in a day, perhaps not even in this generation, but eventually, it will get done. The wonderful thing, is I don’t have to do it all. This week’s Twitter chat is our first #MacroSW discussion on The Grand Challenges for Social Work Initiative- a series of working papers brought forth by social work practitioners, scientists and scholars under the umbrella of the American Academy of Social Work and Social Welfare (AASWSW). This chat, hosted at 9:00pm EST by macro practitioner, Sunya Folayan- will address the Grand Challenge: Financial Capability and Asset Building for All. One aspect of this Grand Challenge asks social work educators, researchers, practitioners and students to be financially literate in order to promote social and economic justice in society; and to infuse financial literacy into practice, research and teaching. The Grand Challenges for Social Work are described as ambitious but achievable goals for society that mobilize our profession, capture the imagination of the public and require innovation and breakthroughs in science and practice to achieve. The AASWSW invites social work practitioners, scientists and scholars to participate broadly in discussion and problem solving dialogue. This Grand Challenge chat @#MacroSW will engage members of our profession in bringing our brightest ideas, creative collaborations, and intentional innovation to the fore. Our weekly generated resource bank will add to the body of knowledge created in addressing social work’s grand challenges. Social Workers have been powerful societal change agents for over a century- moving the nation through periods of stress, and unrest that characterize periods of social change and industrialization. Today’s global 21st century landscape brings with it more complex and interrelated problems which will require higher levels of problem solving. Today’s social work professional must play a more central, collaborative and innovative role in our ever changing world. If there ever was a need for the social work profession-that time is now. #MacroSW is a collaboration of social workers, organizations, social work schools, and individuals working to promote macro social work practice. Macro social work practice focuses on changing larger systems, such as communities and organizations. It encompasses a broad spectrum of actions and ideas, ranging from community organizing and education to legislative advocacy and policy analysis. The chats are held weekly on Twitter every Thursday at 9 p.m. EST (6 p.m. PST). Sherraden, M.S. Huang, J.,Callahan, C., Clancy, M.M., & Sherraden, M. (2015). Financial Capability and asset building for all (Grand Challenges for Social Work Initiative Working Paper No 13), Cleveland, OH: American Academy of Social Work and Social Welfare. Welcome back from the busy holiday season! Join host @karenzgoda and the #MacroSW crew for an hour of YOUR issues, comments and ideas on Thursday, January 7, 2015 at 9pm EST. Spring Schedule Highlights: We are excited to announce our new weekly chats! Grand Challenges for Social Work Theme Nights. In these chats, we will explore the Grand Challenges initiative by the American Academy of Social Work & Social Welfare. Our first Grand Challenge chat will be on 1/14 discussing Building Financial Capability for All. #PoliticsNOW. We will be taking a deeper look at policy, politics, and the upcoming Presidential election. Our first #PoliticsNOW chat will be on 1/21. Documentary movie nights. Our first movie night will be on 1/28 discussing the film Growing Up Trans. Twitter Combination Hashtag event during Social Work Month. March is Social Work Month and we are working with folks behind other social work Twitter hashtags to develop an awesome event(s). Date(s) TBD! Social work students from across the country are welcome to participate in a student-focused Twitter Chat about income equality. Join us for a live, interactive event in which social work professors Jimmy Young, of the California State University San Marcos, and Laurel Hitchcock, of the University of Alabama at Birmingham, will facilitate a live discussion about the documentary film Inequality for All on Thursday, October 8th at 9 p.m. EST (6 p.m. PST). 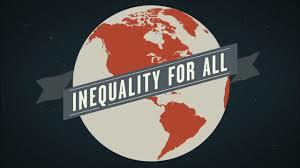 Watch the documentary Inequality for All. Your instructor may ask you to write a brief statement about your reaction to the movie. Join in on this week’s #MacroSW Twitter chat as Rachel West and Sunya Folayan co-host this chat hosted at the beginning of the academic year as new learning agreements are developed in schools of social work around the country.